Our readers have been asking when the current season of Counting On will be over. On Monday, October 1st, the network will air a two-hour episode featuring Josiah Duggar and Lauren Swanson's wedding. Sadly, that will be the season finale, and another TLC show will take over the 9pm ET time slot the following week. As of now, the network has not announced a return date for new episodes of Counting On. But you can rest assured that we will continue to post Duggar updates during the break. We have been blogging about the family for nearly nine years, and we have no plans to stop. 9pm: Josiah and Lauren's Prank-Less Wedding? NEW! Over already? How sad! our family enjoys watching the Duggars so much! Please bring back the whole family and make the season's longer! I wish there were more episodes in the season too. I love the Duggars. Back up. They all need to live life away from the camera and just lay low. Yearly specials would be nice though, just to catch up every few years. I agree...I think the show has run its course however I would like to see specials. Turn the channel if you don’t like it!!! Nothing wrong with still watching and hoping it will improve, 7:36. If everyone turned the channel, the ratings would be zero. Nothing wrong with saying what you thought about the show, either. Nothing ever changes unless someone realizes or points out that change is needed. Yes, please make Counting On stop! No more Duggars on TV. The show has run it's course. Then why do you read a blog about them? Without tv we would not know who they are. You don't speak for everyone. Thank goodness. Go away if you are not a fan. So tired of negativity. That's not true. They can still do specials and social media. TLC has other much higher rated shows than counting on for example The Little Couple. The ratings for the show have not been bad but not been great either, the show will never go back to the viewing figures 19 Kids once had. Every show eventually runs out of steam and counting on looks like its loosing momentum, when once die hard fans start complaining and stop watching its time to stop. Duggar boys: A wedding is no place for "revenge." You're in CHURCH. TLC always overdramatizes it; makes it look worse than it ends up being. There was probably no "revenge". Agree - those wedding pranks in church are very disrespectful to each other and to the church. At least someone tried to tell them that before the ceremony this time. They've done some appalling stuff in church other times. I was raised that the first thing you do when you sit down in church is to pray or meditate on why you're there and clear your mind of all outside things for that time. Plotting "pranks" has no part in that. Considering that you're standing there making a covenant with God and each other, pranks have no place in a wedding ceremony. If you're the pranking type, there's always the reception or your next family gathering. 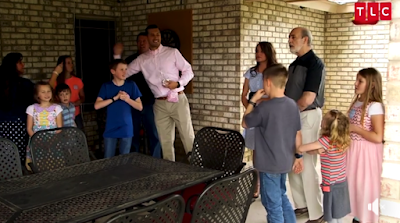 As much teaching time as JimBob and Michelle have invested into teaching their children to honor God, I'm surprised this pranking each other during a covenant ceremony with God ever got started. I thought they were supposed to have so much respect for God. It seems like the prankster is really drawing attention to himself too-another Duggar no-no according to Michelle during the 14-19 Kids and Counting series. That was a very short season. Will there be another one? Read the post. That explains it. that one was already on guess we all be sleeping during this show. time to cancel this show. I realize it is frustrating seeing the same episode over and over again, however it is not the Duggar family who does this scheduling or arranges for the filming schedule. It is the TLC Network that decides which episode to air and when. Again, I know your frustration, but have realized I was directing my anger in the wrong direction. I hope we can continue Counting On I'm always reading after meeting Michelle this summer , her sister attends my church. I'm reading the book she signed. Love you all. The season is already over. We saw Josiah's wedding earlier. This is not a new episode, just a rerun. TLC needs to learn that they have to stop rehashing already aired content. Let his show go now, while it might have a shred of dignity left. Someone better get married or have some more babies to keep this show going. Jessa, Lauren, and Abbie, I'm looking at you. Jed & Jeremiah, time to go a-courtin'. Jana, time to plant the fall crops, feed the ducks, and walk the dog, I guess. The show will be back, its ratings are stronger or on par with other TLC shows and the show runners have been following John David and Abbie's courtship. It's just a question of when the season will premiere. Curious where you find the ratings for the various TLC shows. I have googled with no success! Showbuzzdaily posts the top 150 cable shows each day. They don't separate TLC shows out, but they do list which network a show is on and you can track Counting On or other popular TLC shows by the week. Counting On usually draws in approx 1.2 million viewers. This past Monday CO drew in 1.089 viewers while the previous week it was 1.228. The ratings have dropped for Counting On in comparison to its first season. However, that season dealt with the aftermath of Josh's scandals and viewers tuned in to see the aftermath. It has lost ratings in subsequent seasons, however, it hasn't gone under 1 million this season while previous seasons it did. It now has settled in with a base audience of loyal fans and critics. Those who watch to criticize the Duggars still help their ratings. TLC even looks to see how many people watch show clips in order to gauge public interest. The show holds its own with other TLC shows and has more companies willing to adverse on during the show. It will continue long as the show makes the network money, draws attention, and has steady viewership. It ratings are a fraction of what 19 Kids brought in at its height with Jessa's wedding drawing 3.5 million viewers. I remember looking at ratings one week for C.O. and the Spongebob Squarepants cartoon show had beaten them in prime time. SpongeBob SquarePants is still a popular show. There's no shame in being beaten by a beloved cartoon. Parents who grew up watching it are now starting to share it with their own children. Doesn't change Counting On's status at TLC. Please quit complaining and be glad we have ANYTHING to watch. So what if they already showed the wedding? This is a longer version plus Abby will be introduced! I hope they continue showing it for many years to come! There will prob be a new season in Jan or Feb like b4. The Duggars aren't the only thing to watch. There's lots of good family programming if you're willing to watch older shows (which my family is). Some we own and our library has a pretty decent-sized DVD section. Usually, the older stuff is in high demand where I live, Even though they have multiple copies of the same series same season, we often have to wait/check back/reserve. A lot of people are looking for good, "clean" family programming-but most of us want a little more than a steady diet of courtships, big weddings, and baby showers. I'm not knocking the Duggars; I think they have some things right. It's just that Counting On has become pretty shallow-the milk, not the meat. No one ever really faces any kind of challenge they have to overcome. They're just not relatable to the average viewer. I always thought it would be awesome if all the Duggar s went into a family business like maybe a second hand shop, or a coffee and donut shop etc. I think of the Cake Boss show and how the family all work together and it's not only a productive show but also a lucrative business. The Duggar s have the time and the money to have something like that and it could be Christ centered and also a good witness and example of being a good steward with money. I think the weddings and births and gender reveal parties have fun their course. Either end the show or move in another direction. With all those adults in the family they could have a really nice business and a large family workforce. Something to consider anyway. Duck Dynasty is another example of a family owning a business and now also a restaurant. I would love to know more about their family real estate business. What types of properties interest them? How do you determine a good investment? Do you mostly buy, then sell; or do you buy, then lease commercially? How and when do you begin teaching the kids the business? Stuff like this fascinates me, and I enjoy learning. And what exactly would this family business be? 7:43 that’s actually a really good idea. I agree that the constant parties are getting old. I agree...so sick of courtships weddings and babies. Also tired of the scripted awkward parties. The show either needs to move in another direction or respectfully end. If they went into a family business? Do you not realize they have a family business, and have been self-employed for decades? So let us see it. So much emphasis on parties and shopping is shallow and getting a bit boring. I would love to see how they all work together in the business. Do they have disagreements? How do they keep the lines of communication open? Do they have equal say in how it’s run? Or does Jim Bob make the decisions and everyone follows his orders? Working in a family business isn’t easy and I think it would be nice to see how they manage it. Seeing them get frustrated with each other once in a while would make them seem more real, instead of like a Stepford family. seriously- if tlc can’t think of ‘storyline’s’ ASK THE WATCHERS what the want! My two cents about the whole thing is that the Duggars do not know how to show appreciation to their fans as well as the Bates do. The Duggar shows are a whole hour but they are chock full of flashbacks and reruns. The problem to me is WHY? There are plenty of people in the Duggar family and their circle that they don't need to short change the fans all the time. A lot of fans have stuck with them and we deserve better. We want to see the weddings and babies of course, but instead of so many flash backs, do a little something with the other folks. I do not want the show cancelled, just up the game a little. Please. Looking forward to seeing this new season when it reaches the UK. Can't be much longer now. I truly enjoy this show and hope it continues. The values they follow are values not many follow anymore. I think ots interesting and after watching the show it always makes me feel like there are good families out there. I may not agree with them religiously but I think they are good role models. 5:26- how do you know what my values are? It really makes me sad to read that people don't believe that others have good values, or even better values than the Duggars. They keep showing episodes we have already seen with like 5min of exyta fotage. We saw each wedding twice and same with births. Cant they be like the other tlc shows like little people big world who can edit and show a wedding etc in real time and don’t show the weddings twice a season. It’s not a new episode is we have seen it already! Same with Kendra’s birth.. It's called circling the drain. Please bring back Counting On....For a longer season...Also I want to say this if you don't like the show that is your right BUT you dont have to get on here and talk down the show because they are those of us that LOVE the show.TV needs more FAMILY shows.